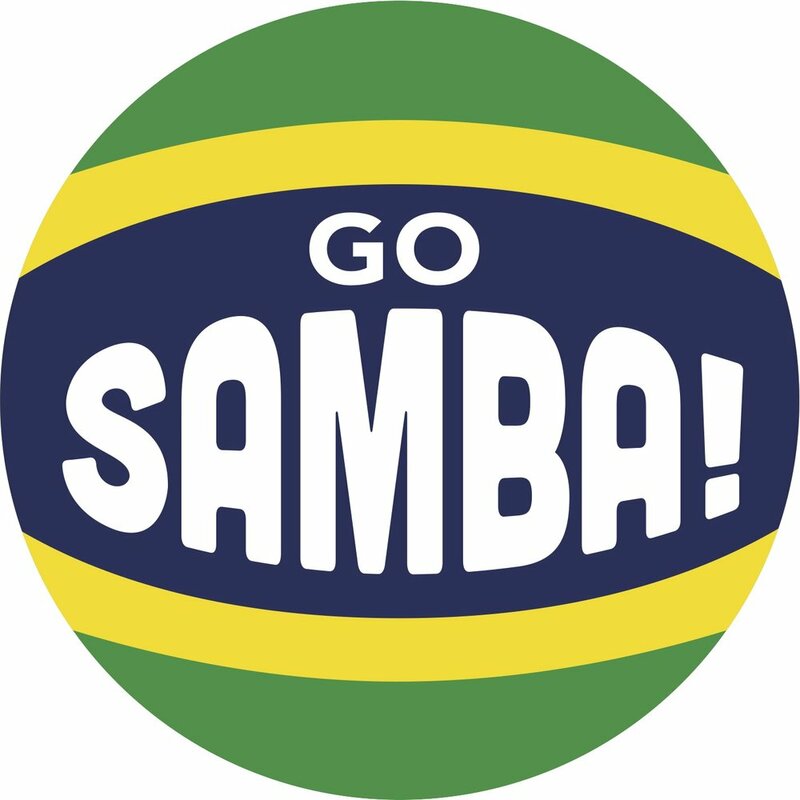 Samba Fogo is a non-profit Cultural Arts Organization inspired many years ago by the excitement and beauty of Afro-Brazilian Music and Dance. For over a decade we have been studying, performing and teaching in Utah along the Wasatch Front and the Western United States. Caixas, surdos, repiniques, straps, mallets, tamborims imported from Brazil!!! One of the most powerful voices of Brazilian popular music, Margareth Menezes has been in the Brazilian music scene for the last 30 years. She is famed for her energetic live performances and regularly tours and performs at carnival celebrations. Her career began in 1987 when she recorded her first LP single (Pharaoh - Divinity of Egypt by Luciano Gomes) and sold more than 100,000 copies. True to her roots, she mixes elements of African, Brazilian, indigenous and pop music in a movement she calls Afropop Brasileiro Movement. She is famed for her energetic live performances and regularly tours and performs at carnival celebrations. Margareth remains one of the most dynamic and popular of the contemporary Brazilian artists achieving international recognition. Margareth Menezes has gained international prominence since the 1990s, when she joined the King Momo tour with the group, Talking Heads at the invitation of David Byrne. Since then, she has 22 international tours. Their album Kindala (1993), that had participation of Jimmy Cliff, yielded the first indication to the world-wide Grammy. With the CD Margareth Menezes Pra Você (2006) and the Brazilian CD / DVD (2006) was again indicated. 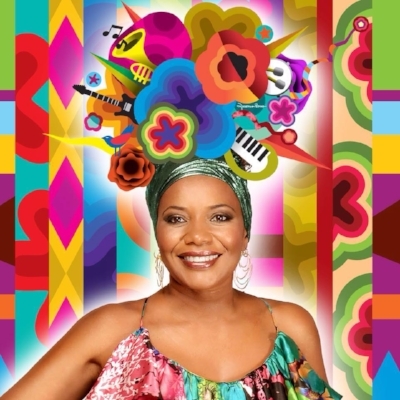 In 2004, with the participation of Alcione and the Mangueira drummer, Margareth recorded her first DVD (Live at the Salvador Summer Festival), which sold 50,000 copies. In addition to awards, the singer keeps in her career several successful songs, such as Dandalunda, Elegibô, Toté de Maianga, Selei (Salute to the Caboclo). In 2010, the artist released her most recent work, the DVD Naturalmente - Acústico, with contributions by Carlinhos Brown, Roberto Mendes, Luís Represas, Saul Barbosa and Marivaldo dos Santos from Stomp. Your source of caixas, chocalhos, repiniques, surdos, straps, tamborims, tamborim sticks all imported from Brazil! Born and raised in Olinda in the state of Pernambuco in northeastern Brazil, Beto Guimareas is dedicated to sharing the richness of his culture through many forms of Brazilian dance such as Samba, Samba de Roda, Pagode, Coco de Roda, Samba Reggae, Frevo, and Maracatu. Beto has performed throughout the U.S, as well as internationally.. He is a long-time teacher of dance at California Brazil Camp, and is currently the director of dancer for Portland, Oregon’s MARACATUpdx..
Chris Quade Couto was born in 1981 in Cologne/Germany. He began his career as a musician already as a child and with only 15 years, specialized in Brazilian percussion. He played with famous artists like Dudu Nobre and Joyce Cândido, participated in intensive workshops in Brazilian and Cuban percussion with teachers like Dudu Tucci and Ravin Jayasuriya, played in groups such as Pimenta Malagueta, Tim Sein Lada and Cologne Street Beat, founded and directed the samba school Unidos de Colônia and the samba group Suco Legal and played percussion in the Samba Funk band Muamba. Nowadays he is a musical director of Bloco X, singer and percussionist of the forró trio Capangas, percussionist of the Denise Krammer Trio, founder and percussionist of the Roda de Samba do Alemão and since 2004 he plays in the bateria of Unidos da Tijuca (winner of the Carnival in Rio de Janeiro in 2010, 2012 and 2014) and other samba schools in Rio. Chris works as a musician and teacher of Brazilian percussion, as a producer of cultural events and CEO of the town twinning association Köln-Rio e.V. 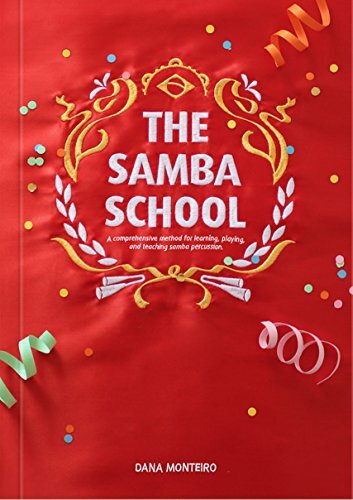 He is famous for his excellent samba workshops, with which he travels each year throughout the whole world. During the last years, he visited many countries, such as Japan, USA, France, Italy, Poland, Finland, Sweden, Scotland, Serbia, Portugal, etc. and in spring 2010 even held a special workshop for the percussion students in the famous Conservatory of world music in Rotterdamm/Netherlands. Chris is endorser for instruments of the brand Contemporânea. Curtis Pierre “The Samba Man” of New Orleans. He is the founder and director of Casa Samba, the first School of Samba in the Louisiana and the Southern Region. Born and raised in the carnival traditions of New Orleans for the first 20 years of his life. He was introduced to Brazilian percussion in 1979 by Airto Moreira, world renown Brazilian drummer for Miles Davis. He later studies percussion with Bill Summers, percussionist for Herbie Hancock; Munyungo Jackson, percussionist for Stevie Wonder; and Ron Powell, percussionist for Sergio Mendez & Kenney G. just to name a few. Since 1988 he has studied with many Masters of Samba percussion, whom are known in Brazil as Mestre de Bateria (Maestro of the percussion band). 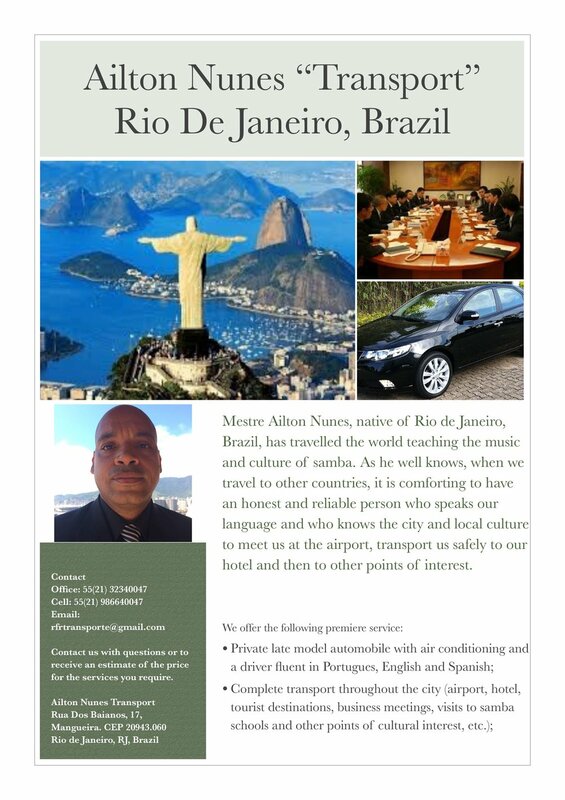 He has studied at some of the top Samba Schools (carnival groups) in Brazil with Mestres like Mestre Marcoa of Salgueiro, Mestre Jonus of Mocidade and Mestre Ailton of Mangueira just a few of the ones a long list of the very best. He has studied exclusively with master Brazilian folkloric and percussionist, Jorge Alabe from Rio de Janeiro in self-supported residency endeavor for over 15 years. In the past five years, he has also studied with master percussionist Marcio Peters from the world famous Brazilian Samba School, Ile Aye in Salvador Bahia. In 2004, Curtis paraded with the percussion group for Salgueiro in Rio de Janeiro carnival,the biggest carnival performance in the world. In 2009, he gave a workshop to members of ILE AYE on Samba from Rio de Janeiro. In addition to all this, Curtis Pierre is a teacher of the Afro Brazilian martial arts Capoeira Angola for over 20 years. He was taught by his master teacher of Capoeira Angola, Cobrinha Mansa of Salvador Bahia. Since 1998, Curtis Pierre "The Samba Man" has conducted his interactive Brazilian drumming programs at workshops, schools, museums, performing arts centers, libraries, conventions, festivals, and team-building events from California, Oregon, Washington & Washington D.C., New York, Pennsylvania, Louisiana, Mississippi, Texas, Virginia, Arizona, and internationally in Brazil, Mexico, Japan and Korea. By Curtis Pierre aka ?The SambaMan? Reed Flygt is the Head Percussion Instructor at the Evanston Escola de Samba. Originally from Baraboo, Wisconsin, Reed is now enjoying life even more. He is in his seventh year of teaching in Chicago Public Schools where he serves as a music instructor at Lane Tech College Prep High School. Reed attended the Lawrence University Conservatory of Music, where he studied Instrumental Music Education and Percussion Performance with Dane Maxim Richeson. His further experience in African and Brazilian percussion comes from study with Nani Agbeli at the Dagbe Cultural Institute in Kopeyia, Ghana, (2008, 2010, 2012); ethnomusicologist Philip Galinsky in Rio de Janeiro (2010); and attendance at California Brazil Camp. In addition to teaching Brazilian percussion at EEDS, Reed’s current music projects include playing drums with the bands Fatbook, Ragged Claws, and leading the Chicago-based professional samba group Bloco Maximo. He would like to personally acknowledge all of his teachers. More specifically Dr. Philip Galinsky and Samba New York, Dane Richeson, and Jorge Alabe. Also Marcus Santos, Ailton Nunes, Jimmy Biala, Dudu Fuentes and many of the Chicago area musicians such as John Beard, Marcos Oliveira, Dill Costa, Heitor Garcia, Geraldo de Oliveira, Dedé Sampaio, Felipe Fraga, Will From Brazil, and Moacyr Marchini. Lastly, he would like to acknowledge the members of Bloco Maximo which include John Beard, Rudy Loo, Kyle Dallman, Matt Korajczyk, Peter Korajczyk, Andrew Green, Harjinder Singh, Evan Jacobson, Collin McCanna, Eric Kummer, Ted Toussaint, Jake Crowe, Zach Himelhoch, and Caitlin Andrew. He would like to thank his Mom, Dad, Brother, Aretha, and Fergus for all of their continuous support. Amy was honored to accept the musical directorship of Super Sonic Samba School in the winter of 2014 and is excited to share her knowledge of Brazilian drumming with the community. She began playing percussion at eight years old, and continued her education in percussion performance to achieve a BA from Humboldt State University under Dr. Eugene Novotney and a MA From The University of Akron, Ohio under Dr. Larry Snider. Although thoroughly rooted in Western music, Amy fell in love with the music of Brazil at age 18 and followed her passion to study the technique and rhythms of the baterias of Rio de Janeiro and Bahia, as well as the traditions of Maracatu, Pagode, Forro, and Candomble. Her teachers have included Mestres Ailton Nunes, Marcos Santos, Mark Lamson, Michael Spiro, Marivaldo of Ile Aiye, Guiereme Concalves, and Zorival of Olodum. Amy approaches the teaching of Brazilian music from a place of respect for the culture and the traditions behind the music. She uses Western methodology in the teaching of technique and rhythm as well as a traditional folkloric approach, making her classes an excellent learning place for beginning as well as experienced community members. A drummer since the age of eight, Rhythm Traders founder Brad Boynton set off in 1990, for a nine month trip to West Africa, with a degree in Anthropology and his backpack. He chose Africa because it appeared to be the epicenter of rhythm itself. Whether it was American jazz, Brazilian Samba, or Cuban Rumba, all roads pointed back to Africa. While in Ghana, he lived with nomads, drummers, drum makers, fortune tellers, and oral historians. And today he is going to share some stories about his journey. Aílton Nunes grew up in the community of Mangueira in Rio de Janeiro, Brazil. From early childhood he was involved in the revered samba school of his community, Estação Primeira de Mangueira. Over time, he became known for his passion for samba, his talent as a musician and his leadership style. He served as director of Mangueira da Manhã, the children's version of the Mangueira drumline, for many years. Since becoming Mestre da Bateria da Mangueira (leader of Mangueira Samba School’s carnaval drumline) in 2011, Aílton has developed a reputation for surprising innovations in the evolution of samba. As a teacher, Aílton Nunes is famous for never raising his voice or losing his temper. Consequently, he is able to motivate 300 to 500 of the best drummers anywhere to play some of the best samba on the planet. Mestre Ailton took over Mangueira’s bateria in 2011, that same year receiving the coveted Estandarte de Ouro for best bateria performance at Rio’s Carnaval. Ailton also participates in the group Dose Certa and Ensaio de Escola de Samba de Leandro Lehart. Marco is one part insurance professional, one part musician, one part lover of the outdoors, one part Cuban salsa dancer and lover of the runon sentence. Along with Nick Fabin, Marco leads Bloco Energia in Vancouver, B.C. Marco started playing Brazilian Rhythms in 2007 with Sambata, led by Paul Bray. Since 2012, he has been focused on growing the community that is Bloco Energia and spreading his love of Samba, and rhythm in general. Marco has been fortunate to have learned from many teachers such as Paul Bray, Jorge Alabe, Jimmy Biala, Mark Lamson, Marcus Santos and Dudu Fuentes, among others. Marco loves to travel and play with other groups when he can. Besides Vancouver, Marco has also played with groups in Toronto, Seattle, Oakland, Portland and Rio. Alex is a cultural producer based in Toronto, and often moonlighting in Rio de Janeiro. He is the founding Artistic Director of Uma Nota Culture and has spent many years as both an artist and an independent music promoter, always focusing on music from the ‘tropical world’. He has been at the forefront of many productions in conjunction with Lula Music & Arts Centre and the Luminato Festival, as well as several projects in Brazil. He is currently an Artistic Associate at Harbourfront Centre in Toronto. Since 2002, Alex has lived within the rhythm of maracatu and has researched and studied various styles; immersing himself in the style of the northern area of Recife. He counts among his teachers Mestre Walter de França and percussionist Eder Rocha. Alex was among one of the first to start a maracatu group in North America in late 2003 when he founded Maracatu Nunca Antes. Today, Alex is the artistic director of Maracatu Mar Aberto, spearheading the young troupe’s artistic initiatives and community driven presence in downtown Toronto. Michael Spiro is a world-renowned percussionist, recording artist, and educator, known specifically for his work in the Latin music field. Spiro's formal education includes a bachelor's degree with honors in Latin American Studies from the University of California, and three and a half years of graduate work in ethnomusicology at the University of Washington. His practical education consists of a seven- year apprenticeship with Francisco Aguabella (a relationship which continues today) and extensive study throughout Latin America. He has studied annually in Cuba since 1984 with musicians such as Jose Luis Quintana ("Changuito"), Esteban Vega Bacallao ("Cha-Cha"), Daniel Diaz and Juan "Claro" Blanco of Orquesta Ritmo Oriental, Regino Jimenez, Los Muñequitos de Matanzas and Grupo Afro-Cuba de Matanzas. In addition, in 1986, he spent two months training at G.R.E.S. Portela, the famous Escola de Samba in Rio de Janeiro. Spiro currently resides in San Francisco, Calif., where he is an integral part of the Bay Area music scene. He records and produces with groups throughout the West Coast and still tours world-wide with the percussion trio Talking Drums, which he co-leads with David Garibaldi and Jesus Diaz. 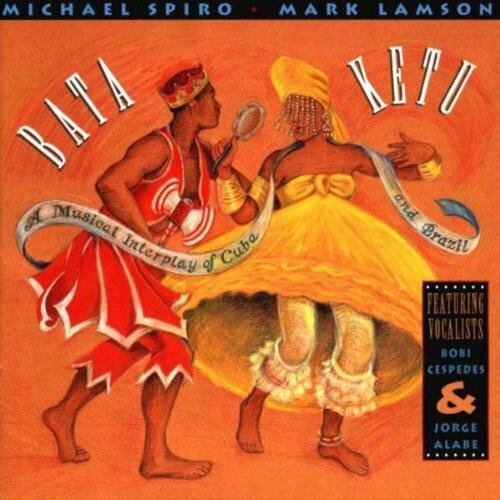 In June 1996, his recording Bata-Ketu was released on Bembe Records to international critical acclaim, including being voted one of the top 50 drum records of all time by Drum Magazine. In 2004, Spiro received a Grammy nomination for his work as both producer and artist on Mark Levine's Latin/jazz release Isla, and, in 2005, he released BataMbira, which he wrote and produced with Professor B. Michael Williams. The CD received rave reviews around the world for its fusion of Afro-Cuban folkloric music with the mbira music of Zimbabwe, and that same year, he was voted runner-up in the jazz/fusion category in Drum Magazine's Reader's Poll Awards. 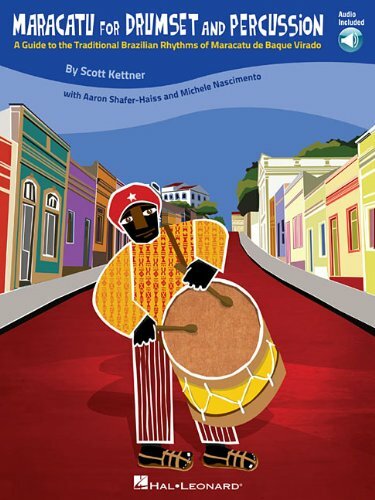 In 2006, Chuck Sher Publications released his book, The Conga Drummer's Guidebook, and it has already become the standard in the field for intermediate/advanced instruction. He is a frequent visiting artist at universities worldwide. In addition to the position he held in the Jazz Department at the University of California, Berkeley, Spiro has taught at numerous colleges throughout North America and Europe, and continues to be a presenter at national and statewide conventions of the Percussive Arts Society and the International Association of Jazz Educators. Spiro's recording and performing credits include such diverse artists as David Byrne, Cachao, The Caribbean Jazz Project, Dori Caymmi, Changuito, Richard Egues, Frank Emilio Flynn, Ella Fitzgerald, David Garibaldi, Gilberto Gil, Giovanni Hidalgo, Ray Holman, Toninho Horta, Bobby Hutcherson, Dr. John, Mark Levine and the Latin Tinge, Machete Ensemble, Bobby McFerrin, Andy Narell, Ray Obiedo, Chico O'Farrill, Eddie Palmieri, Lazaro Ros, David Rudder, Carlos Santana, Grace Slick, Omar Sosa, Talking Drums, Clark Terry, McCoy Tyner and Charlie Watts. In addition, he has recorded on soundtracks to such major motion pictures as Soapdish, Henry and June, True Stories, Sworn To The Drum, Walker, Eddie Macon's Run and Dragon-The Life of Bruce Lee. He also wrote several arrangements for the Tony Award-winning Broadway show BLAST!, which was released on video by PBS in 2002. Dana Monteiro is a proud New York City public school teacher with thirteen years of experience, twelve spent at the Frederick Douglass Academy. Monteiro has a B.S. in music education from N.Y.U., a M.A. in music education from Teachers College, Columbia University and is currently a doctoral candidate in music education at Boston University. Originally a classical trumpet player, his interest in Brazilian music began on a trip to Rio de Janeiro, where he was brought by local musicians to the Vila Isabel Samba School. It was there that he heard his first bateria and decided that this music would be successful at the Frederick Douglass Academy. Since that first visit, Monteiro has made 16 study related trips to Brazil and made visits to samba schools and community music ensembles in London, Tokyo, Chicago, Philadelphia, Las Vegas, Uruguay, Argentina, and the Cape Verde Islands to study local musical practices and more importantly, the various methods for how music is taught. Monteiro was a panel discussant on alternative practices in music education at the 7th International Symposium of the Sociology of Music Education, a presenter in the Education Section at the annual meeting of the Society for Ethnomusicology in 2013, and presented aworkshop in samba percussion at the 2015 Teaching World Musics Symposium at Northern Illinois University. He is currently conducting research for his dissertation titled Samba: The Sense of Community in Participatory Music. Versatile percussionist Carl Dixon is at home with music spanning multiple genres, continents, and instruments. He can be found performing in concert halls, jazz clubs, dance parties, festival stages, and street parades. Carl plays with the Brazilian music band Ginga. 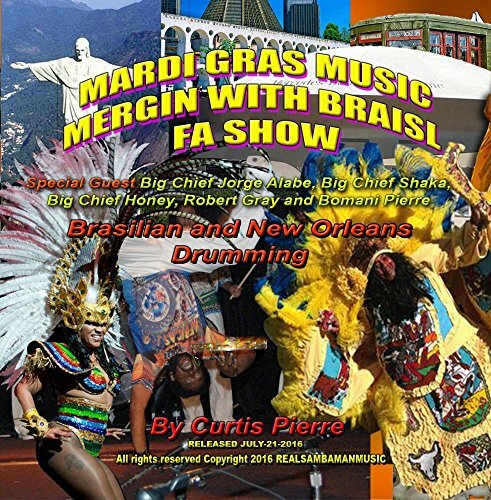 As a drumset player and percussionist, he has performed/recorded with the Kailin Yong Peace Project, NuMundo, Swing Je T’aime, Casuarina, Alessandro Penezzi, Paula Santoro, Sambadende, Elevations Jazz Orchestra, Pat Bianchi, Jeff Jenkins, Dexter Payne, many musical theater productions, and the Rio de Janeiro bloco Bangalafumenga. Carl is the Principal Percussionist of the Central City Opera, Fort Collins Symphony, and Cheyenne Symphony, percussionist with Opera Colorado, and has performed with the Colorado Symphony, Colorado Ballet, Boulder Philharmonic, Colorado Springs Philharmonic, and Greeley Philharmonic Orchestras. Carl teaches drumset and world percussion and directs the percussion ensemble at the University of Colorado-Boulder. He is the Musical Director of the Boulder Samba School and Bateria Alegria, a 20-30 member Brazilian drumming ensemble. He teaches private lessons in all areas of percussion and has presented workshops at Indiana University, University of Wisconsin-Madison, Naropa University, Colorado College, Colorado State Univeristy-Pueblo, and the Colorado and Wyoming PAS Days of Percussion. Carl received a Master of Music degree in percussion performance from the University of Colorado-Boulder, where he studied with Dr. Douglas Walter and Paul Romaine, and a Bachelor of Music degree from the University of Wisconsin-Madison, where he studied with Anthony Di Sanza. Other important teachers include Michael Spiro, Mark Lamson, Jorge Alabe, and Mestre Marcão of Salgueiro. A Wisconsin native, Carl spends his free time in the mountains rock climbing and backcountry skiing, road biking, and building and restoring percussion instruments. Episode 16 Rio Remote with Jeremy Parker and Macapa of Macapart Straps! Jeremy Parker is a full time dad and Registered Nurse with a part time raging music addiction! He fell in love with his Brazilian wife and visited her homeland for the first time in 2004. He gravitated quickly toward Capoeira and found another new love in playing the instruments and Afro-Brazilian rhythms that he learned in the streets and rodas of Rio de Janeiro. He has been singing and playing music ever since including blues, rock, and funk. But, his primary focus is on Brazilian music like samba, pagode, choro, and maracatu. He has been a member of the San Francisco Bay Area's only performing Maracatu group, Maracatu Pacífico, for three years and is currently studying and playing with one of Rio's finest maracatu groups Tambores de Olokun. Want to make a big group order to the U.S. from Kalango.com? Keep everyone's order, money, shipping straight with Dev Nambi's handy spreadsheet! It even regularly updates the U.S. dollar to the Euro! Marcus performed for the president of Brazil, TEDx and with the “One World Band” produced by MTV. Marcus also played at the Sony Pictures Oscar nominated movie ‘Rachel's getting Married’ with Anne Hathaway. He has been honored with the 2013 KOSA Recognition award, Outstanding Arts Performer Award by the Brazilian Immigrant Center (2008) as well as Outstanding Percussionist Award by Berklee College of Music in 2004. Marcus is the author of the DVD ‘Modern Approach to Pandeiro’ and performed in the DVD ‘Musically Speaking II’ by BOSE. Marcus has lead workshops on Afro-Brazilian percussion and music for Social Change in universities and conventions around the world such as Carnegie Hall, PASIC and Harvard. He’s currently the director of the Grooversity network project and artistically directs twenty four drumming groups in the US, France, Germany and Canada. Toni Bernardo is a drummer/percussionist living and working in Manila, Philippines. Her curiosity and love of all things rhythm started her on life’s journey. Playing rhythm and drums is about being part of life. How and where you stand say a lot about how you play. Her musical evolution and roots trace back to, well, life at home! Later on in Baguio City, nurtured by the spirit of the mountain Toni threw herself to the wind and followed her soul’s calling . From Japanese taiko to Cuban mambo, Toni moved in different cultural time cycles taking her through the small streets of Manila to Delhi into Bahia and right into the heart of Rio's escola de samba! Toni was a pioneering member of the band Puro Ritmo and a founding member of the bands Hairy Dawgs and Escola de Samba de Manila. She is the Samba Empress of the Philippines, as founder and drum director of Samba School Imperatriz Filipinense. Toni also guests with Royal Hartigan and the Blood Drum Spirit. Jimmy Biala is a professional music educator, performing and recording artist. During the academic school year Jimmy teaches Cuban and Brazilian percussion programs for several elementary schools in San Jose and Campbell, California and community ensemble classes throughout the year. He is an assistant director for Mestre Jorge Alabê's Grupo Samba Rio Bateria in Oakland, California and also an accompanist for percussion and dance classes at the California Brazil Camp. 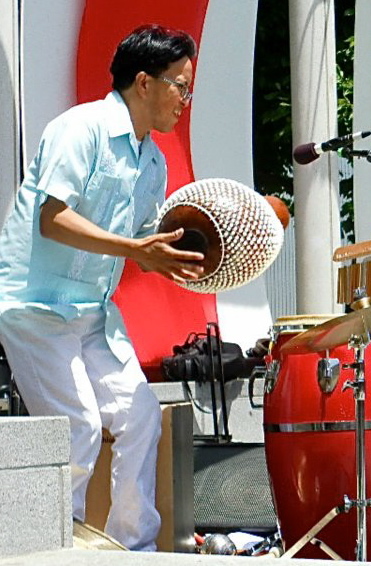 Jimmy performs regularly playing Latin percussion and drum set with different ensembles in the Bay Area. He founded the group SambAsia SF in San Francisco in 2002 and SambAsia Beijing (now called Templo do Samba) in 2006. He was an artist in residence in Taiwan 2005-2007 and in Beijing, China 2007-2010. Currently Jimmy is the director of the ensemble Bloco do Sol based in San Jose, California.